Last night was the annual Canadian Society of Magazine Editors gala, and we’re very happy to report that This was named Magazine of the Year in the small publication category. We think it’s a huge honour, especially considering the fearsome quality of the nominees, including our friends at Explore and Spacing. Industry awards are always a bit inside baseball, I know, but there are some important thank yous I’d like you to note: Thank you to our many talented and hard-working writers, photographers, and illustrators whose work you can find all over this website. This dedicated group of people work diligently to uncover stories you won’t read anywhere else, and they tell those stories beautifully. Thanks to the section editors who worked on This in 2009 (the issues the judges were reading)—Jordan Himelfarb, Lindsay Kneteman, Stuart Ross, Eva Salinas, and Ivor Tossell, all virtuoso wielders of the red pen. Thanks to David Donald, our art director, who led the redesign of the magazine last spring and makes our words pop on the page each issue. Thanks to publisher Lisa Whittington-Hill, who oversees all the business operations that make this whole show run. And thank you to the Red Maple Foundation’s board of directors, the bedrock team whose guidance and mentorship has sustained This Magazine for 44 years. 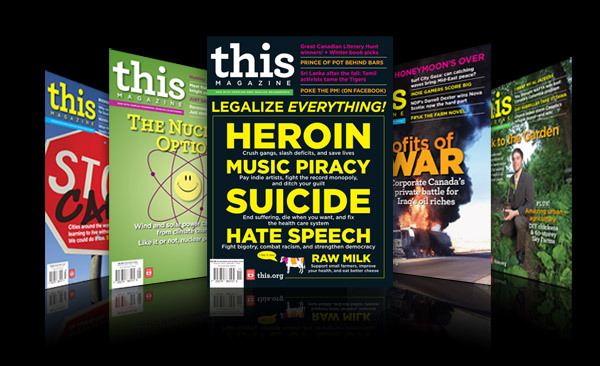 And, of course, thanks to you, the readers, donors, volunteers, and supporters who believe in the magazine and its mandate. We love the work we do and we hope that comes through on the page. The award is nice—we were thrilled to get it—but the award isn’t an end in itself. Publishing the best journalism by the next generation of great Canadian writers is the mission, award or no. A mission like that needs your support. If you like This, please tell your friends about it. If you haven’t already, buy a subscription (before the HST crash lands, Ontario and B.C.!). Or buy someone else a subscription. Or become a donor. Your support doesn’t have to be monetary, either—retweeting that story you liked or sharing it on Facebook is a great way to spread the word. Thanks for reading.